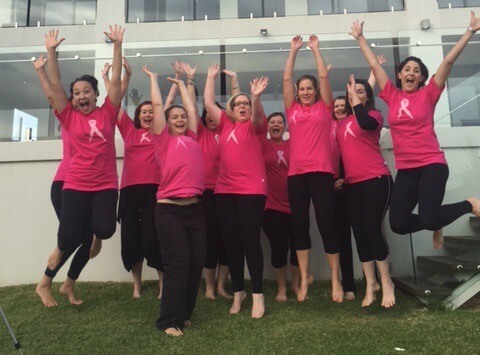 13 young breast cancer survivors who recently took part in creating an empowering full body paint fundraising calendar convened on the Gold Coast late in May as part of their drive to raise funds and awareness (#breastaware) for Breast Cancer through the sale of the 2017 Calendar. The young women, all diagnosed with breast cancer before they turned 40, joined internationally renowned body paint artist Wendy Fantasia, project organisers and support crew, as well as a documentary filmmaking team on Friday May 20 to Sunday May 22. Accommodation was generously donated by Elite Holiday Homes for the weekend and the girls all stayed at Casa Luxe. Casa Luxe was the perfect place to stay for the girls and offered everything they needed for the perfect catch up, with seven bedrooms and five bathrooms meaning that everyone enjoyed shared time and space to relax when needed. The girls all travelled from their home towns and cities, and kicked the weekend off with a fully donated, VIP styling and champagne event courtesy of local businesswoman Sonia Stradiotto, owner of Sonia Stradiotto Couture. Following debriefing sessions and a tour at a National Breast Cancer Foundation funded laboratory at the University of Queensland, the girls gathered together to launch the Breast Cancer Fundraiser Calendar’s new branding and website, including opening pre-order sales. The weekend included continued coverage by the documentary filmmaking team from Filthy Look Films. Most importantly the weekend was about bringing the girls together in solidarity, to debrief their unique shared experience of full body painting and photo sessions, and cancer and recovery journeys. Practical workshops were also delivered to enable model participants to help promote the calendar through social media with #younggirlsgetbreastcancer too and #breastcancerfundraisercalendar, and in their communities to sell as many calendars as possible. This calendar fundraising project is the brainchild of Rachelle Panitz, herself a Breast Cancer Survivor, diagnosed when she was 32. When breast cancer turned her family and professional life upside down she decided that when she was better she would harness this setback and help empower other women. Ms Panitz also features in the calendar.